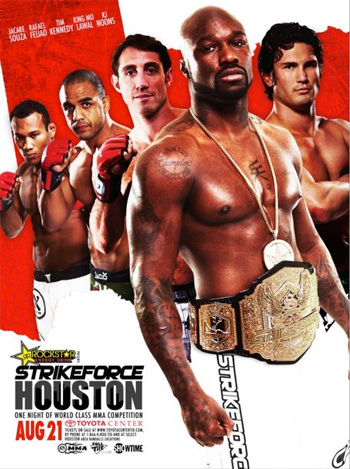 Although there are still a few days left until game time, the Gambling Gods have been forced to make some significant changes to their initial proclamations for “Strikeforce: Houston” as the money appears to be moving quickly. The Showtime broadcast will feature two championship scraps. Ronaldo “Jacare” Souza meets Tim Kennedy for the vacant middleweight title in the night’s co-main event and Rafael “Feijao” Cavalcante challenges Muhammad “King Mo” Lawal for his light heavyweight crown in the featured attraction. Less than 24 hours ago, Kennedy was pegged at +240 but has since dropped to +190 as Saturday steadily approaches. Jacare, on the other hand, only slipped 25 points to -275. King Mo was last seen showcasing his superior ground game against former champion Gegard Mousasi at “Strikeforce: Nashville” en route to jacking the 205-pound belt. He was nearly a 6-to-1 favorite to do the same to the talented Brazilian and retain his strap just two days ago. Unfortunately, his majesty also saw an unfavorable turn in his betting line, as the light heavyweight champ’s juice dropped 25 percent to -550.